The Dashboard is the highest level of the TurnClick experience. This is where you can view and manage all the pages you’ve edited. You can launch the Canvas for any page, pause or activate edited pages, access the View + Share window, and modify the name of the page. Here is an overview of some of the key features you’ll find in the Dashboard. One of the main features of the dashboard is the views counter. This shows you how many people have viewed your Share Link or Live Page Link. By default, TurnClick assigns a system generated name to each page you modify. The name is pulled from the meta title of the page you first load into the Canvas when you modify a new page. If you’d like to change this for organizational purposes, you simply click the "Edit Name" link and the inline editor will load and let you modify the title to whatever you&apos;d like. From the Dashboard, you can easily launch into any of your pages by clicking the image thumbnail or title associated with your campaign to begin editing. You’ll notice a “Pause” button for each of the pages in your Dashboard. If you click this button, it will pause your campaign so that any visitors that are currently able to see your modified pages through the Live Page Link will no longer see the modifications. It temporarily pauses the Live Page Link from functioning. 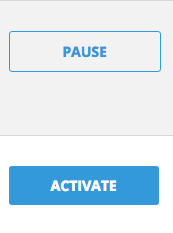 You can easily turn it back on by clicking “Activate”. The “Sort by” dropdown gives you several options for sorting your list of pages for easy management. This is especially useful if you have many pages listed in your Dashboard.